Anyway, clear sunglasses, amiright? 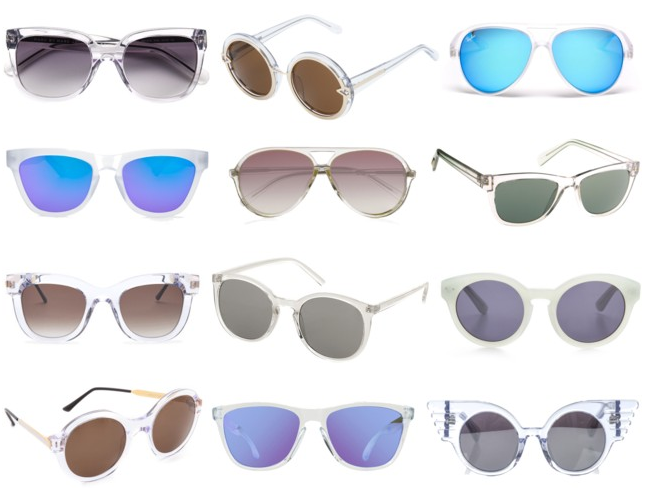 I have watched this trend grow and swell in the city since September's fashion week, but I first became a fan of shades with translucent frames back in about 2009, when one of my guy friends in Seattle wore the (above, bottom, center) Frogskins from Oakley at a #Seafair party. This take on sunny day eyewear is sporty, playful and currently comes in a frame to suit any face. If completely sheer shades aren't your thing, you can always opt for a frosted take, like the color revolution colorway from (personal fav) Westward // Leaning or Madewell's frosty mint 'Hepcat' lenses. While the two aren't mutually exclusive, I especially love a translucent frame paired with a reflective lens, don't you? It lends a very 1980s feel (in a good way) - and lets you unabashedly people-watch as long as you don't turn your head too obviously or raise your eyebrows too conspicuously. What do you think of translucent sunglasses? All the details [top to bottom; L to R]: Marc by Marc Jacobs / Karen Walker 'Orbit' / Ray-Ban aviators / Westward // Leaning color revolution / Linda Farrow for Matthew Williamson / Cole Haan / Theirry Lasry 'Sexxxy' / TopShop 'Preppy' / Madewell 'Hepcat' / Theiry Lasry 'Milfy' / Oakley 'Frogskin' / Linda Farrow for Jeremy Scott. I can't decide if I love the clear clutch or the clear sunglasses trend more! I love it! I love the witty titles. And I love that song. Love the sunnies, too. I love the look of clear frames. I don't think they work for my skin tone though, which is interesting considering that they are not a color, but they still are cool. I'm really liking the colourful lenses in sunnies everywhere! For all these years I was never able to find a perfect sunglasses that suite me.